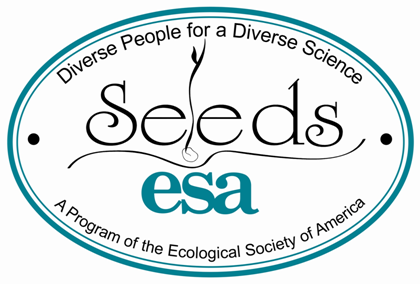 SEEDS is ESA’s flagship award-winning education program. Its mission is to diversify and advance the ecology profession through opportunities that stimulate and nurture the interest of underrepresented students to participate, and to lead in ecology. Focused mainly at the undergraduate level, with extension services for communities, high schools, graduate students, and international collaborations, the SEEDS program promotes an ecology profession with wide representation to ensure environmental understanding and a sustainable future for all. EcologyPlus aims to connect diverse college students and early career scientists with timely and relevant career opportunities and a community of peers and professionals in ecology and related careers across all sectors. EcologyPlus is both an alliance and an approach to integrate available partner programs that foster the participation of underrepresented minorities in a broad range of career pathways where ecology plays a role. EcologyPlus recognizes the need for diverse ecological expertise in a wide variety of fields. ESA established the Committee on Women and Minority Affairs in 1988. In 1991, it became a Standing Committee of the Society. This committee provides leadership and recommendations for ESA diversity initiatives. This report was the result of a 2005 survey of the ESA membership to: (1) determine the pattern of graduate degrees in ecology earned; (2) determine ethnicity and gender composition in the field; (3) catalog the nation’s environmental science capabilities; and (4) analyze current patterns of employment. The EJ Section promotes the engagement of ecologists in addressing environmental injustice issues through education, research and outreach. The Inclusive Ecology section encourages and supports ecologists from underrepresented groups, as well as supporting all ecologists striving to make ecology more inclusive through their research, teaching, outreach, and engagement with policymakers ,managers, and other ecologists. Contact: Kennedy “Ned” F. Rubert-Nason, Ph.D. The TEK Section promotes the understanding, discussion, and respectful use of traditional ecological knowledge.